A monkey-shaped novelty tea-infuser could be Jeoung Young-min’s ticket to Canton Fair, which is the biggest trade fair in China. And after months of political obstacles, things are finally starting to happen. Days after China and South Korea agreed to shelve their year-long dispute over the Thaad U.S. missile system, small-scale exporters from the nation trying to break into their neighbor’s giant economy expressed optimism that trade restrictions and a de-facto boycott of their goods is over. Jeoung’s brand, a startup maker of design household goods, fell victim earlier this year to the falling out. Their first attempt at product marketed in China -- the monkey infuser -- was suddenly no longer able to clear Chinese customs and a tenth of their consignment already sold was returned, Jeoung said Friday at a booth at this year’s third installment of the Canton Fair in Guangzhou. 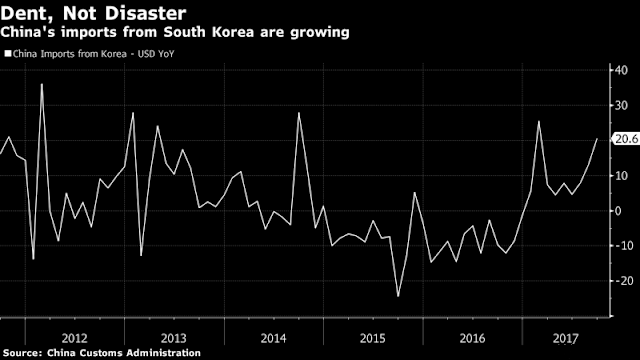 As the two nations began to work toward a solution to the impasse, trade restrictions on his product were lifted and Jeoung says without this "burden" he’s hoping the China market can make up 40 percent of his sales within five years. As the world’s second-largest economy becomes a shopping superpower in its own right, manufacturers like Jeoung may represent a shift in the trade profile of the two countries, adding more consumer goods to the smartphone components and engineering products that currently dominate. 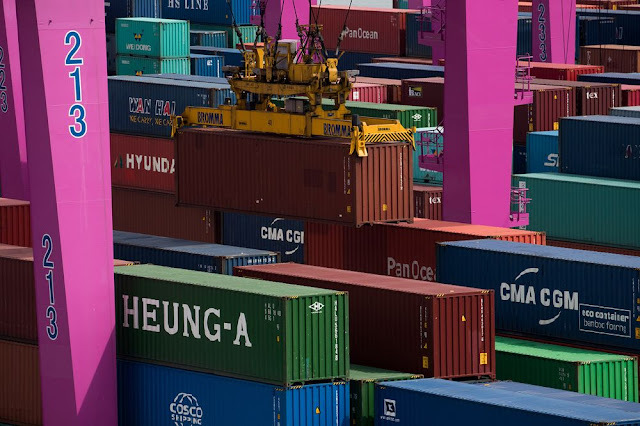 China is South Korea’s largest trading partner, with more than $246 billion in bilateral commerce last year. But despite the tough rhetoric around deleveraging, measures of credit continue to show expansion, with aggregate financing surging to a six-month high of 1.82 trillion yuan ($274 billion) in September. China’s corporate debt surged to 159 percent of the economy in 2016, compared with 104 percent 10 years ago, while overall borrowing climbed to 260 percent. While some business interrupted during the row is beginning to resume, exporters in Guangzhou underlined that it’s not a uniform process. Cody Kim, an executive at Chamos Cosmetic Co. Ltd which makes skincare products for outside brands and markets its own Acaci line, said in Guangzhou that his company’s exports to China dropped by about 50 percent. The method of the Chinese clampdown was again red-tape: Approval and import restrictions suddenly became draconian, and he says they still haven’t improved. "Every Korean skincare manufacturer faced the same import and registration issues suddenly," Kim said in an interview. "We’re hopeful that things will improve now that there’s an improvement in the bilateral relationship. It’s only been a few days so we haven’t seen anything on the ground yet. But the China market has enormous potential for us."